What should we do while we are in Nashville? That said, the following things tend to appear on our Nashville Visitors Must-Do List time and time again. So if you ever get a chance to do these things… you must!!! If you ever get the opportunity to stay at the Opryland Hotel, you should. It’s one of the most beloved Nashville Tennessee attractions. As far as Downtown Nashville hotels, we like the Sheraton hotel, the Hilton, Hampton Inn and the Renaissance hotel best — due to their close proximity to the nightlife. Here are 8 of the most unique hotels in Tennessee, including 4 in Nashville! Brentwood, TN – just south of Nashville, there are a handful of nice hotels right near the I65 exit. Here are some Brentwood hotels worth considering. Franklin, TN – just south of Brentwood, it’s a real trendy place with plenty of fun things do right there. Our personal favorites listed in the best restaurants in Franklin and the best restaurants in Brentwood aren’t necessarily the best for tourists who are typically looking for unique eateries in the area. Just keep in mind the places on those 2 lists were chosen primarily because we tend to frequent them regularly as locals. Tasty? Yes. Unique? Not so much. For breakfast: Pancake Pantry – Get there early, there’s always a line to get in. And you never know who you might see there. It’s definitely one of the tastiest Nashville Tennessee attractions — that’s recognized worldwide. For lunch: Noshville Deli – A trendy dive where everyone who’s anyone goes for lunch at least once when they’re in Nashville. The Pharmacy is a fun burger joint and soda shop like no other, and the food is de-lish! For dinner: Mangia Nashville – It’s actually in Franklin, and only open on Friday and Saturday nights. It’s expensive, but worth it! They serve the most luxurious menu in a super fun & casual atmosphere. It’s a place only the locals knew about for years, but it’s becoming one of fastest growing Nashville Tennessee attractions. No joke, it’s truly a show! For dessert: Sweet Cece’s or GiGi’s Cupcakes – Both have super-large servings, ensuring that your sweet tooth will be satisfied! By the way, Nashville is the original Gigi’s location. Anytime: Loveless Cafe – Start with a short drive on the Natchez Trace Parkway, followed by their world-famous biscuits & gravy and some shopping at the Loveless Shoppes. Or, if you’re already downtown Nashville, then try Jack’s Barbeque. 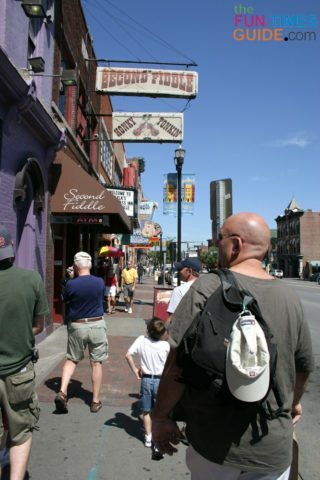 It’s sure to be a hit with everyone, and the place is rich in Nashville history. Finally, everyone likes Mexican food, right? Well Sopapilla’s is better than Mexican food – it’s New Mexican food! Kids will love: Aquarium Restaurant or Rainforest Cafe. Both are located inside the Opry Mills Mall. For even more unique places to eat around Nashville, check out The Eater Nashville. To stretch your legs, enjoy some beautiful nature, and get a little bit of a workout, consider hiking on the Natchez Trace Parkway. There are plenty of lakes around Nashville to enjoy from a boat. Here are the best boating, canoeing & kayaking places near Nashville. And all the best places to rent a pontoon boat. Did you know that Nashville has a swimming beach? It may not be one of the top Nashville TN attractions for tourists, but it’s definitely one of the top attractions for locals. For a nice change of pace, you might enjoy horseback riding in and around Nashville. If you want to see some wonderful scenery and a peaceful place to get away, then Radnor Lake is for you. There’s a nice walking trail, and the wildlife is plentiful! If you like bicycling, then you’ll love exploring Nashville by bike or pedaling through Franklin on the fabulous Pedego electric bike rentals. Good news: All of the nearby beautiful Tennessee State Parks are free! Several are worthy of being included as Nashville TN points of interest. For example, Bicentennial Capitol Mall State Park (one of the top 14 Nashville Tennessee attractions) is close to downtown Nashville and the Capitol Building. While you’re exploring Nashville TN points of interest, be sure to keep your eye out for celebrities in Nashville when you’re out & about. You may also want to take a drive by some Nashville celebrities’ homes — like Miley Cyrus, Tim and Faith, or Alan Jackson’s house! Franklin Factory – a 12-building dining, retail, and entertainment complex that’s listed in the National Register of Historic Places. There are a few shops inside that sell really unique Nashville souvenirs! Opry Mills Mall – nearly 200 stores and restaurants all under one roof. There’s definitely something for everyone! We call it the ‘guy mall’ because even guys who don’t care for shopping enjoy their time here, thanks to guy-friendly stores, massage chairs, big-screen TVs, and local bands. Loveless Cafe Shoppes – grab a bite to eat at the Loveless Cafe, then enjoy the surrounding stores. The Loveless Cafe itself makes everyone’s list of Nashville TN points of interest. Main Street / Downtown Franklin – more than 150 unique places to explore in the 15-block downtown National Register District, including trendy shops, antiques, and restaurants. Here are all the best antique shops in Franklin, plus 4 places to bargain shop in Franklin. 10 Best Places To Shop In Nashville – these shopping spots are the ones that are most often favorited by locals and tourists alike. Hatch Show Print – take home a one-of-a-kind souvenir: an official Hatch Show Print poster! Even if you don’t buy anything, you absolutely must step inside this unique shop on Broadway. I have several of their super cool posters with a Nashville theme. Boot Country and Boots & More – I can’t tell you how many of my friends who visited Nashville for the first time have taken advantage of these stores’ “Buy 1, Get 2 Pairs of Boots FREE” deal. $10 Boutique – looking for a cheap Nashville souvenir?… This is the place to start while you’re downtown! Nashville Flea Market – you never know what you’re going to find at this indoor/outdoor event that takes place on the fourth weekend of every month. Spirit of Nashville – they have some of the most unique pieces of artwork, home decor, and souvenirs I’ve ever seen around here — all with a unique Nashville flavor. Ryman Auditorium – You can even tour the Ryman! Take a self-guided tour, or get a behind-the-scenes backstage tour of the Mother Church. View their upcoming events. It’s one of the most popular Nashville TN points of interest, for sure. Classic Country Music Locations – These are less expensive alternatives to the Grand Ole Opry. Best Small Music Venues – If you’re looking for small and quaint, then you’ll love these intimate settings where you can see some of the best talent in Franklin & Nashville. 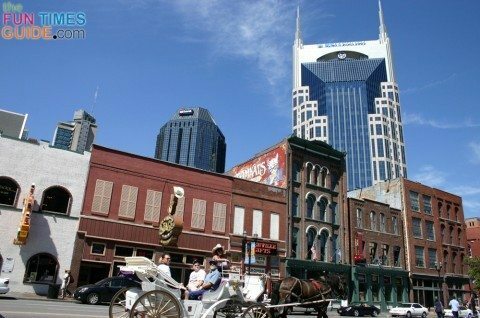 Pub Crawl At Downtown Nashville Bars – We usually stick to the honky tonks on Broadway, but there are lots of fun options here for a Nashville bar crawl! Most of the above events and activities can be enjoyed any time of year. Nashville Sounds Baseball – The Triple-A affiliate of the Milwaukee Brewers, and a minor league baseball team of the Pacific Coast League (PCL). Franklin Main Street Festival – A free event featuring more than 200 artisans & crafters, 3 stages, 2 carnivals, and an international food court to round out a full weekend of entertainment. Iroquois Steeplechase – Drawing an average crowd of 25,000, this is one of Middle Tennessee’s top sporting & social events. Franklin Electric Bike Rentals – You can tour the town on two wheels. Franklin On Foot – See the sights at your own pace, or choose a guided tour. Tips For Viewing Nashville’s 4th Of July Fireworks – If you’re in town over the Fourth of July, here are some insider secrets for viewing the fireworks. Franklin Rodeo – Fun for kids of all ages, and a great opportunity to wear your favorite cowboy and cowgirl attire! Leaf Peeping In Tennessee – From late September through late October you’ll see the most colorful leaves in Tennessee. Haunted Franklin Walking Tours – These take place year-round, but they’re more exciting around Halloween! They also have ghost tours in Nashville. Nashville Corn Mazes – Venture into some of the most amazing corn mazes located in Nashville and Middle Tennessee. Holiday Lights At Opryland Hotel – Many people make this an annual family tradition. The Dancing Lights Of Christmas – Another popular holiday light show that happens to be very near the Opryland Hotel. It’s Middle Tennessee’s largest drive-thru light and music show. Franklin Trolley Holiday Lights Tour – A fun way to see all of the Christmas lights is to let the locals chauffeur you through town to gaze at all of the glittering decorations. Here are 365 things to do in Nashville, plus 365 more fun things to do! See all of the upcoming events in Franklin, TN & Nashville right in one place. Mrs. Cheap’s personal picks for 101 top things to do in Nashville TN. Here’s an itinerary to help you see the best of Nashville and Memphis. Don’t miss what others said about Nashville after their first visit to Music City! Check out Jimmy Carter’s Nashville Guide. After all, he’s your source to the stars. Here’s a guide to sophisticated fun in Nashville, with tips from Gwenyth Paltrow when she was filming in Nashville. And just for fun, check out the most overrated and underrated things to do in Nashville Tennessee.